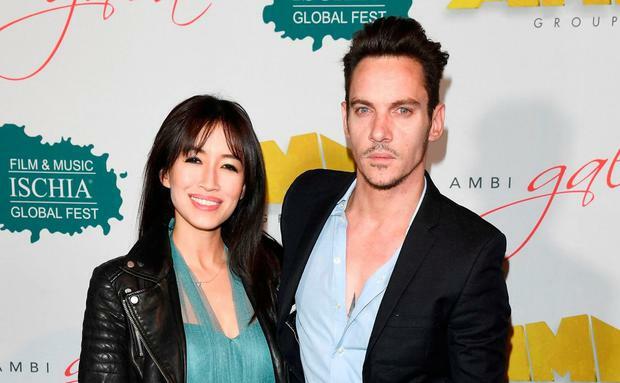 The wife of actor Jonathan Rhys Meyers, who was questioned by US police after he allegedly used an e-cigarette on a flight, thanked supporters for their "compassion on this ongoing battle with addiction we are in". Mara Lane denied reports that there had been a verbal row between herself and Meyers on board a flight. "There was no argument," she wrote in a social media post, but admitted Rhys Meyers had spoken 'unkindly', adding it was "out of his character". The star (40) was said to have got into an altercation with Ms Lane as they were travelling between Miami and Los Angeles last weekend with their son Wolf (1). Rhys Meyers was allegedly smoking an e-cigarette on the flight - a federal violation in the United States. However, he is understood to have told airport police at LAX that he had not been vaping. When the plane landed, Meyers was questioned by a number of airport police on the tarmac after getting off the plane, but the FBI chose not to respond to the incident, US website TMZ has claimed. Last night, Ms Lane said Meyers was "extremely sorry for an inconveniences caused to anyone travelling yesterday". "Eight months of sobriety and an unfortunate day of airline travel," she wrote. "We were in South America specifically working holistically through anger issues that result in these kinds of episodes." She added: "We are home safe and he is feeling deeply sorry for any remote disrespect afforded to me, attendants, onlookers or officers. Thank you for your compassion on this ongoing battle with addiction we are in." It's not the first time the Cork actor has been in the headlines for the wrong reasons. Just over three years ago, he made a public apology after photographs emerged of him in a dishevelled appearance, drinking vodka from a bottle on a street in London. Rhys Meyers has battled with alcohol addiction for over a decade. He described the incident three years ago as a "minor blip" in his recovery. A further relapse took place in September last year, when the actor was spotted staggering around Dublin Airport.